In this current heydey of craft cocktails, it’s really difficult to get excited about pre-mixed alcoholic beverages. But because we’re never one to turn down a free drink, we decided to lower our expectations and give a new brand a try when a four-pack was delivered to our headquarters. 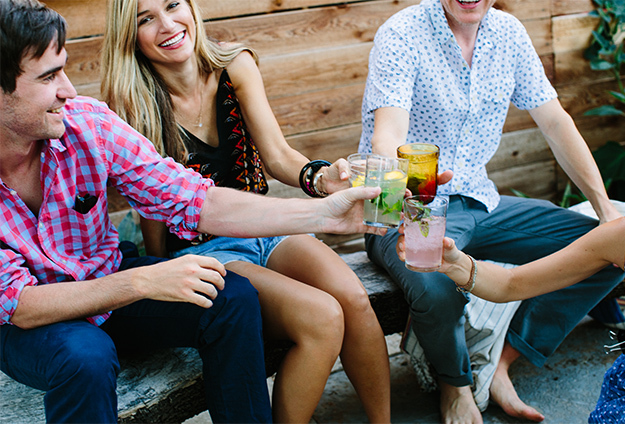 Well, we guess it’s true that everything that comes out of Austin is cool because Austin Cocktails are easily the best tasting pre-mixed boozy concoctions on the market. And they’re low-calorie to boot. The small company utilizes vodka distilled six times for its current line of four incredibly smooth and delicious beverages, including Cucumber Vodka Mojito, Vodkarita, Tea Twister and our favorite, Paradise Found, a delectable blend of coconut water, stone fruits, citrus and basil. Rather than relying on disgusting artificial sweeteners to create a low-calorie beverage, Austin Cocktails uses organic agave nectar in each of its cocktails for just a touch of sweetness. Each of these drinks is ready-to-go right from the bottle, but if you throw in a few fresh herbs and a tiny umbrella or two, we’re pretty sure your guests will never know you weren’t in the kitchen dislocating your shoulder shaking up these libations. They say everything is bigger in Texas, but here’s proof that everything is tastier, too.